You are currently browsing articles tagged Ireland with kids. Some say Irish dogs are different from other dogs: more soulful, wiser, friendlier even. Hmmm, maybe… maybe not… However, let me tell you about one fabulous Irish dog! Years ago, I was traveling around Ireland with several American friends, one of whom had lived in Dublin as a child for several years. She observed that Irish dogs were quite different to dogs in other countries, they were “purposeful.” Rather than wandering or straying, Irish dogs appeared to do things deliberately, purposefully, with their tails high and a definite goal in mind. As we explored small towns and villages, we began to see the local dogs through her eyes. They did indeed seem very busy, and appeared to have goals and direction. They’d trot down the street, stopping to greet people and other dogs, tails wagging, a glint in their eyes, and after a moments’ connection, would resume their course with every appearance of purpose. Tayto Park: Odd Name, Brilliant Day Out! One of the biggest tourist attractions in Ireland is Tayto Park, but it’s one that many overseas visitors skip because they haven’t the faintest idea what it is. Wicklow is a great corner of Ireland if what you love is rugged scenery and outdoor pursuits. The mountains are picturesque, windswept, and just crying out to be the backdrop for your own romantic adventure. Helen Fairbairn’s Dublin & Wicklow: A Walking Guide will ensure you don’t get lost on your trek, nor (if you follow her advice) will you find yourself hopelessly out of your depth. The Giro d’Italia came to Ireland this summer, and you can still trace its path through various parts of the country by the way everything was painted pink. McCollam’s Restaurant and Pub went completely pink for the Giro d’Italia, and hung a lot of bicycle wheels on the building for good measure. Fore Abbey is one of the lesser-known monastic ruins in Ireland, which is a shame, as it’s a great place for a family day out, offering places to climb, a stream to play in, a rag tree to decorate, and hills to explore. 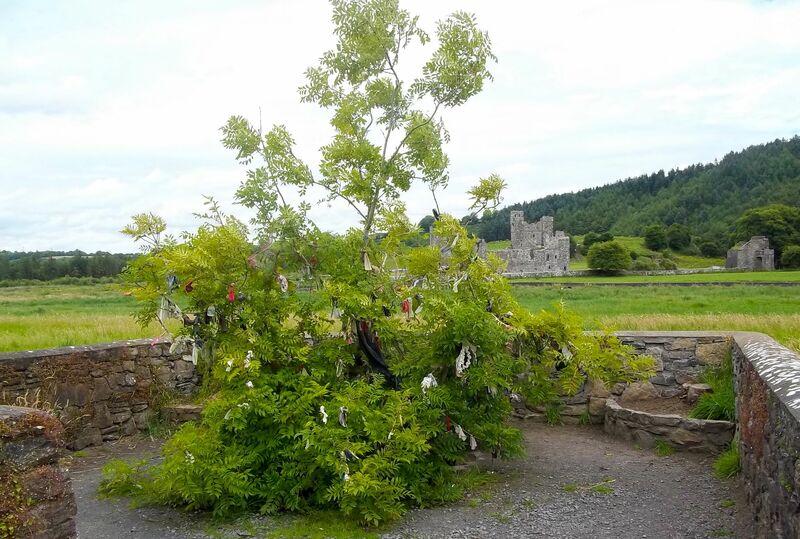 The Rag Tree with Fore Abbey in the background. 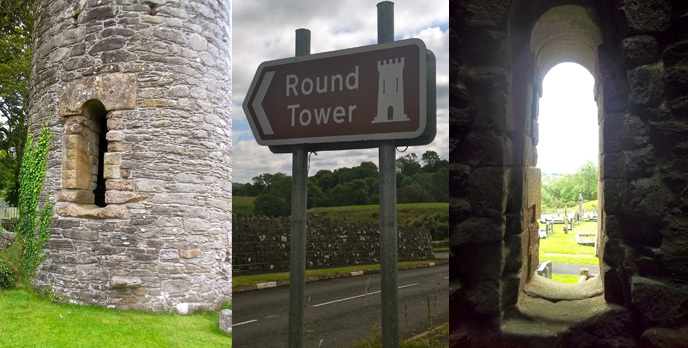 Founded about 630 by St. Fechin, Fore Abbey lies near Lough Lene in Co. Westmeath. The original monastic community was largely rebuilt by the Benedictines in the 13th and 15th centuries, and these comprise most of the ruins you can visit today. 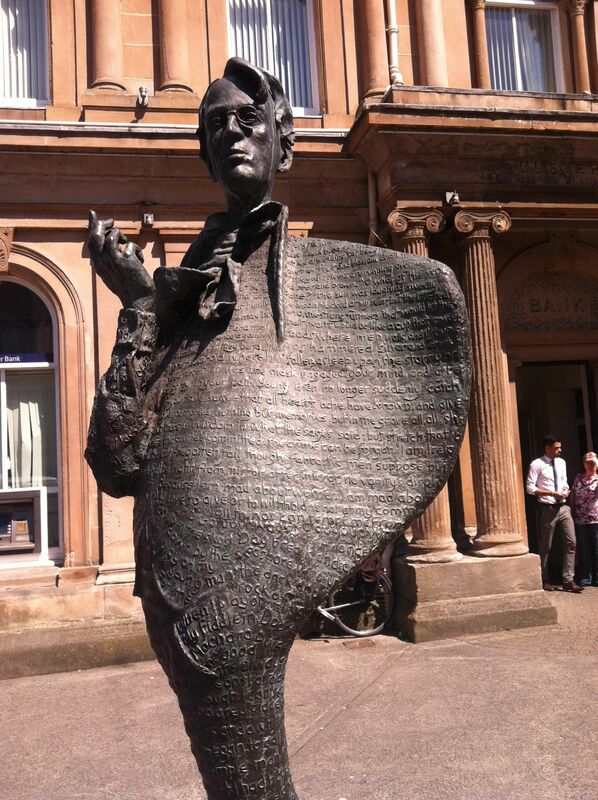 Nobel Prize-winning poet W.B.Yeats is County Sligo’s most-famous son. When you visit the town you can’t miss this visually striking statue of the poet. The statue of W.B. Yeats in front of the Ulster Bank building in Sligo town. Schools are out, the sun is shining, and July is — among other things — the season for arts festivals! What’s On in Ireland, June 2014: Festivals Galore! What’s happening around Ireland in June? As usual, there are lots of great festivals. There’s something for everyone in June. Cork has a long maritime tradition, which is celebrated in this annual week of special events, races, exhibitions, and fun. There’s plenty for all the family, from guided tours of Irish naval vessels to circumnavigating central Cork City by kayak, with great music, food and drink on hand. The highlight is An Rás Mór, the big race, in which all manner of sea-going craft compete across a variety of distances: restored curraghs, yachts, long racing boats, and tiny kayaks. Bloomsday: What’s it All About? Bloomsday is the annual celebration of all things James Joyce, but mostly his love-it or loathe-it masterpiece, Ulysses. When I lived in Dublin many years ago, I noticed an annual upsurge of American grad students hanging out in the pubs around Trinity, boasting unpublished manuscripts analyzing Ulysses, and claiming to be in town for some conference or other and hoping to find a publisher. If half of them really had a book completed, it would have taken half the Amazon rain forest to print them. But, I suppose it was a measure of the cultural impact Joyce’s relatively difficult novel has had across the world.